On Nov. 26, 2018, Rio Tinto announced that it has entered into a binding agreement with China National Uranium Corporation Limited ("CNUC") for the sale of its entire 68.62 per cent stake in Rössing Uranium Limited, owners of the Rössing mine in Namibia, for up to $106.5 million. Rio Tinto is holding talks to sell its majority stake in Rössing to the China National Nuclear Corporation. This was confirmed by mines and energy permanent secretary Simeon Negumbo yesterday, who told The Namibian that although the ministry was aware of the "ongoing discussions", he was not in a position to provide more information on them. The talks are, however, said to be at an advanced stage. "In the absence of any agreement reached and the CNNC business model, the ministry has no information on the matter until the ministry has received an update. This transaction will still need the approval of the minister (for the deal) to proceed," he said. Rössing MD Werner Duvenhage, however, brushed off the reports as "rumours or market speculation". For this reason, he said, the mine did not want to comment. The 'Nuclear Intelligence Weekly' last week suggested that if talks are successful, CNNC will acquire its largest overseas uranium asset, and would see complete Chinese control of Namibia's active uranium production, with China General Nuclear's (CGN) Husab mine already next to Rössing. It is official, or so it appears: Rössing Uranium, the world's largest open pit uranium mine - which also happens to have been in operation for the longest period - is scheduled to cease operations in 2025. Rössing's managing director, Werner Duvenhage, says: "There are currently no drilling initiatives and existing mineral resources, which could expand mining beyond this period into the next decade." In an invitation for expression of interest for the preparation of a desktop socio-economic status update report Rössing Uranium Ltd writes on Mar. 27, 2017: "Rössing Uranium Limited has been in operation for 40 years. The approved life of mine runs until 2025 at which stage formal mine closure is likely to commence." Rössing has commissioned a health study among all its former employees. "The aim of the epidemiological study currently being undertaken is to determine whether there is an excess work related cancer risk in the uranium mining workers at the Rössing mine", said Rössing's Managing director, Werner Duvenhage. Rio Tinto's Rössing Uranium contract workers met at the mine at Arandis on Wednesday (Oct. 7) to hand over a petition to the management, accusing their employer of violating their rights. The petition stated that contact workers are "being exploited for cheap labour", alleging that one permanent employee's salary was equal to the salary of seven contract workers, especially considering security personnel - even though "they do the same work but are paid and treated differently". They are also complaining about allegedly being forced to work longer hours and if they complain their "job security is threatened". The contract workers claim they allegedly do not get medical aid, housing allowance and social security in many instances, and are "dumped" at home when they get injured on site and are replaced by someone else. Two TransNamib locomotives and one of 20 wagons filled with sulphuric acid for leaching of uranium ore at Rössing mine at Arandis derailed near Dune 7 between Walvis Bay and Swakopmund on Monday (July 13) evening. One tanker can hold about 100 000 litres, hence the entire cargo was about two million litres of acid. Submit comments by January 20, 2015. Submit comments by October 7, 2014. Rössing to construct its own desalination plant: Rössing Uranium will construct its own desalination plant, to be located 6 kilometres north of Swakopmund at the existing Swakopmund Salt Works. SLR Environmental Consulting Namibia and Aurecon Namibia have jointly been appointed to oversee the environmental impact assessment process. Currently, Rössing Uranium purchases desalinated water for its mining operations at a significant cost. As an interim measure, Rössing Uranium, along with other mines in the region, have been supplied with desalinated water from the Areva desalination plant near Wlotzkasbaken, since November 2013, SLR said in a statement. NamWater has been pursuing the development of a new desalination plant at Mile 6 roughly 10km North of Swakopmund, but the outcome, timelines and commercial aspects to this project remains uncertain. An agreement to secure water on a long-term basis from Areva's desalination plant at economically feasible terms could also not be reached, SLR said. It will take a long time before Rössing Uranium comes up with a scientific study that will form part of an independent review of the health, safety and environmental impacts associated with its mining activities. In April, Earthlife Namibia and the Labour Resource and Research Institute (Larri) said in a report that miners who dug uranium ore that supplied the British and US military in the 1970s with the raw material for bombs and civil nuclear power were dying of cancers and unexplained illnesses after working at Rössing. The company has for many years denied these allegations. Rio Tinto Group will cut the workforce at its Rössing uranium site in Namibia by 23 percent as the world's second-largest mining company responds to weaker demand for the metal used to fuel nuclear power plants. Production will fall to "slightly less" than 2,000 metric tons in 2014 from 2,409 metric tons in 2013, Rössing Uranium Ltd. Managing Director Werner Duvenhage said on a conference call today. It will cut 265 of the 1,168 positions at the mine. Rössing will maintain production levels that will enable the company to satisfy long-term sales contracts, Duvenhage said. "We are significantly downgrading production targets." Satellite images of Rössing Uranium Mine show running streams and large pools of red and green sludge collecting alongside the mine's tailings dam. Given that mine tailings contain some of the most toxic substances on earth, the issue has sparked public concern. The tailings dam is located just to the north of the mining pit and not far from the Swakop River. Images obtained via Google Earth show unidentified liquid forming into rivulets and pools, some outside the protective walls of the tailings dam. On Jan. 17, 2014, Rössing announced that one of two modules in the mine's leaching process has been successfully brought back into service this week. The mine will be recommencing its operations, albeit at a reduced rate, over the next couple of days. The processing plant is expected to be brought back to normal operations during the current quarter. Initial findings indicate that the tank failure was due to localised external corrosion of the tank. All milling operations at Rössing Uranium Mine ground to an immediate halt after "a catastrophic structural failure" at one of twelve leach tanks in the processing plant on Tuesday (Dec. 3). In a statement released on Wednesday (Dec. 4), the company said that a "leak was detected on [Number] 6/1 Leach Tank shell and as a result it was decided to pump out the tank for fixing. Two operators went on top to close 6/1 leach tank launder and opened up 5/1 leach tank launder to re-route the slurry. The other four operators were below (close to 2/1 leach tank) fitting the water pipe used for flushing the pump out system... located next to 6/1 leach tank. During this time 6/1 leach tank experienced a catastrophic structural failure on the shell, while one of the sectional operators was on top of the tank... the operator on top of 6/1 leach tank was swayed onto the hand rail. He sustained minor bruises to his left lower arm and knee." > A nearly identical accident happened only four days later on Dec. 7, 2013, at Rio Tinto's Ranger mine in Australia, view details. On Sep. 26, 2013, Rössing Uranium Limited announced that it has entered into a long-term sulphuric acid supply agreement of about 225,000 tonnes sulphuric acid annually with Dundee Precious Metals Tsumeb (Pty) Ltd. The acid will be railed from Tsumeb to Swakopmund by TransNamib. It is expected that shipments to Rössing will start during the fourth quarter of 2014. Rössing is currently importing its sulphuric acid for ore processing through the Port of Walvis Bay, from where it is railed to the mine site. The French laboratory CRIIRAD has performed radiation monitoring in the vicinity of the Rössing uranium mine. In addition to measuring dose rates, CRIIRAD collected and analyzed samples of top soil, river sediments, groundwater and surface water. CRIIRAD found impacts of a waste rock deposit on radionuclide concentrations in the sediments of Khan river, on gamma dose rates and radon concentrations in air nearby. Impacts of wind-blown fines from the tailings deposit were identified in soil samples. The origin of elevated uranium concentrations in groundwater downstream from the mine could not be identified. On Sunday May 1, 2011, an engine and a railcar carrying manganese got out of control at Arandis at 02:25 and ran unmanned 28 km downhill towards Swakopmund, until the engine derailed and tipped over to the side. The railcar remained on the track and came to a halt at 54.2 km from Arandis. Around 210 workers from Basil Read Mining Namibia have defied a court interdict issued last Thursday (Mar. 3) for them to halt their work stoppage, which has been going on for over a week. Iran has found a way to receive arrear dividends from European consortium Eurodif and the Namibia-based Rössing Uranium Ltd. which had been blocked due the country's nuclear program, ISNA reported on Wednesday (Jan. 25). Iran's dividend in Eurodif has not been paid since 2006, however, the implementation of the nuclear deal in January 2016 paved the way for Iran to receive its share which is estimated to be around 54 million euros. A high-level Namibian delegation led by Foreign Affairs Minister Utoni Nujoma met its Iranian counterparts in Tehran in December to discuss Rössing Uranium's full compliance with the United Nations sanctions against companies in which the Iranian Foreign Investment Company (IFIC) has shares. During that visit the two governments agreed that legal and technical teams from both countries would meet in Namibia as a matter of urgency to discuss and finalise the details of the draft agreement. "We are still waiting for the Iranian team to visit Namibia and reminded them again about three weeks ago," Mines and Energy Minister Isak Katali told The Namibian this week. A Namibian uranium mine majority-owned by Anglo-Australian mining giant Rio Tinto said it is considering what to do with a stake held by the Iranian government in light of the latest U.N. sanctions. Since 1975 Iran has owned a 15 percent stake in the Rössing Uranium Mine. U.N. Security Council resolution 1929 , adopted in June, bans the sale of any stakes in uranium mines to Iran, as well as shares in any commercial operations linked to the production of nuclear materials or technology. It also says that "all states shall prohibit such investment." Council diplomats told Reuters that the latest steps clearly ban the sale of new stakes to Iran but are less clear on whether any previously held Iranian stakes in uranium mines or other nuclear-related operations should be divested. In a statement dated Nov. 4, 2010, Rio Tinto declared it is its position "that it believes to be complying with the current United Nations requirements." The White House force to prevent nuclear and radiological materials from falling into the wrong hands, the Global Threat Reduction Initiative (GTRI), has told Rio Tinto Rössing Uranium to sharpen its security measures following the arrest last September of three suspects, one a Namibian Defence Force (NDF) member, for possessing and allegedly wanting to deal in nearly 170 kg of uranium oxide. In 2005, Rössing exported 109 t U3O8 to China. (Republikein June 7, 2006). In its 2016 Annual Report, Rio Tinto deleted all resource figures for the Rössing Z20 deposit, previously stated as 20,657 t U (@ 0.024% U) indicated and 25,355 t U (@ 0.022% U) inferred resources: "Rössing Z20 Resources have been written back to mineral inventory following a reduction in the long-term uranium price." On Nov. 11, 2013, Rössing Uranium announced that it decided not to proceed the Social and Environmental Impact Assessment (SEIA) at this stage, "given that work to detail the arrangements for possible mining of the Z20 ore body is continuing. Therefore the SEIA will not be completed at this stage and another round of public consultation will not be conducted as yet." "It is therefore recommended that Rössing Uranium should give serious consideration to a solution for the Z20 project that does not require construction of a highly intrusive road. Two possible alternatives might be a road based on the largely unused road to Zhonghe Resources, or a possible shared-use agreement with the new Husab Project access road. Alternatives should be based on a general principle of reducing the number of infrastructure corridors across the Khan valley." Submit comments by December 14, 2012. The Final Draft Scoping Report was issued on December 18, 2012. On Oct. 23, 2012, Rössing informed citizens in Swakopmund on the proposed mining of its Z20 deposit. The open pit mine to be dug south of the Khan ephemeral stream will have a size of 1 km by 600 m. The ore grade is approx. 350 ppm U3O8. The project would drastically increase Rössing's power and water requirements: a 50% increase of electric power consumption and a 100% increase of water consumption (from 4 to 8 million cubic metres per year). The required amount of water can only be supplied by desalination. "The purpose of this Background Information Document (BID) is to provide stakeholders with the opportunity to register as interested and affected parties (IAPs) in the Social Environmental Impact Assessment (SEIA) process and to obtain their initial comments on the proposed mining of the Z20 uranium deposit." Submit comments by 31 October 2012. "All SEIA documents will be available on the Aurecon (Pty) Ltd website (follow the public participation link)." According to environmental consultancies Aurecon and SLR-Consulting , Rössing plans to mine the Z20 uranium deposit. The deposit is located within the current ML28 mining licence, 5 km to the south of the existing open pit mine, and it adjoins the Husab mine project (formerly Rössing South). It is located within the Namib Naukluft Park. The deposit is to be mined by "blasting, loading and hauling" of the ore. The deposit is to be connected to the existing mill site via a 16 km road and a 13 km conveyor belt with a capacity of 2250 t of ore per hour. Under favourable circumstances, the project might start operation in 2015. In Rio Tinto's 2011 Annual Report (March 2012), the only mention of the Z20 deposit still had been just this: "On the Rössing mine lease in Namibia, evaluation of the Z20 prospect continued", while Rössing's 2011 Report to Stakeholders (May 2012) mentioned "potential for up to 50,000 t of uranium in Z20". On July 5, 2012, the Ministry of Environment and Tourism issued the environmental clearance for the Rössing mine expansion project. Additional plant infrastructure associated with the above. The comment period lasts from October 17 to October 31, 2011. As a founding member of International Council on Mining and Metals (ICMM), Rio Tinto has committed to a number of principles , in particular: "Principle 10. Implement effective and transparent engagement, communication and independently verified reporting arrangements with our stakeholders. [...] Engage with and respond to stakeholders through open consultation processes." The recent admission of Areva to ICMM had nurtured expectations, that Areva finally would commit to more civilized manners, but we now find that the opposite effect has taken place: longstanding ICMM members adopt Areva's infamous practices, such as its 2-week consultation period for the Trekkopje ESIA in 2007! The final EIA was released in November 2011. Establish a ripios (spent ore from heap leaching) disposal area (in the Dome Gorge). On Aug. 10, 2010, public meetings were announced for Aug. 14, 18, and 21, 2010, to discuss the Social and Environmental Impact Assessment (SEIA) for the Rössing mine expansion project. The SEIS, however, is still "nearing completion" and not available yet. The comment period for public participation closes on 6 December 2009. Mining of an ore body known as SK4. Stakeholders are invited to inspect the report and submit their comments by 30 April 2008. On March 18, 2008, Rössing released the Final Social and Environmental Assessment Report: Proposed Expansion Project for Rössing Uranium Mine in Namibia: Phase 1 assessment - Acid Plant, Ore Sorter, SK4 Pit. The Final SEIA report has now been submitted to the Ministry of Environment & Tourism of the Government of Namibia for consideration. A comment period until 29 February 2008 is being provided. On Jan. 22, 2008, Rössing Uranium released the Draft Social and Environmental Impact Assessment (SEIA) for Phase 1 of its Mine Expansion Project as well as the Scoping Report for the Phase 2 Assessment. Stakeholders are invited to inspect the reports and submit their comments by 15 February 2008. Rössing's Scoping Report for the Mine Expansion Project is available for inspection from Nov. 16, 2007. Stakeholders are invited to submit their comments by Dec. 14, 2007.
mining will be extended in 2008 into an area known as SK4, a small ore body adjacent to the current open pit. In addition, a sulphuric acid plant on site with associated sulphur storage and transportation by rail between Walvis Bay and Rössing Mine will be developed in 2008. The feasibility of establishing a radiometric ore sorter plant with associated reject rock disposal facilities is also currently being evaluated and needs to undergo an environmental assessment as part of the evaluation. and the development of satellite open pits in the SH and SK ore bodies next to the current open pit are being considered. Both pit developments might require the establishment of new metallurgical processing plants and potentially new waste rock and tailing disposal areas. 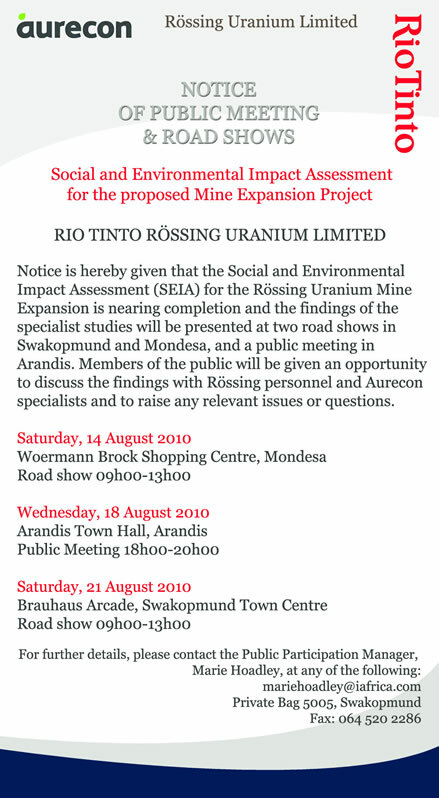 On August 20-22, 2007, Rössing holds three public meetings on its Mine Expansion Project. All indications are that Rössing Uranium Limited is set to extend the lifespan of its mine near Swakopmund "until about 2016". The company announced recently that a Sustainable Assessment (SA) for the life extension of the mine had been completed as part of Rössing's endeavours to extend the current operation to 2016 rather than 2007 as originally anticipated. According to chairperson of the The Mineworkers Union of Namibia (MUN) Rössing branch, Erich Beukes, the company was using money from its decommissioning fund to operate the mine. "There is only enough money left until June this year." Note 1: The Rössing mine (and the associated uranium mill tailings pile) is the by far largest single uranium mining-related liability in the world. Note 2: Rössing's parent company Rio Tinto is a member of the International Council on Mining & Metals - "dedicated to economic progress, environmental protection and social responsibility". Rössing Uranium has announced to shed 200 employees of its 1220 workforce by the year 2000. Rössing is currently operating at 75% of its capacity due to the depressed uranium market. Rössing Uranium has dropped its controversial scheme to dam the Khan River as well as plans to increase production at its Arandis mine in Namibia. The dam was meant to recharge the Khan River aquifer from which the Rössing mine draws water for industrial use. It would have allowed Rössing to double its present potential water extraction from 0.87 million cubic meters to 1.75 million cubic meters a year. "A FORMER Rossing Uranium engineer's quest for compensation was thwarted again on Friday when London High Court Judge Michael Wright decided in a written judgement that Eddie Connelly's case was 'time-expired'. However, Anne Carlson was allowed to proceed in a separate compensation case on behalf of her late husband as Wright dismissed Rio Tinto's attempt to shift the hearing to Windhoek. Peter Carlson died of cancer after working alongside Connelly from 1977 until the early 1980s. Lawyers are studying the Connelly judgement and considering an appeal. The Judge dismissed Rio Tinto's attempt to throw the Connelly case out of Court completely. If the allegations were proven, Rio Tinto would owe a "duty of care" and could be held liable if they had failed in their responsibilities, the Judge decided. Wright also ruled against Rio Tinto's claim that any attempt to prove Connelly's cancer was caused by radioactive uranium dust, was bound to fail. But Wright ruled that Connelly was already out of time when his current solicitor Richard Meeran issued proceedings in September 1994. Connelly himself is prepared to fight on and told The Namibian: "It's ridiculous to say I should have quit years ago. I've got to live with the effects of cancer for the rest of my life." [...]"
"ROSSING Uranium's parent company in London has thrown yet another set of obstacles in the path of cancer victims and their relatives seeking compensation. Rio Tinto has made a surprise application to block the compensation claim brought by Anne Carlson on behalf of her husband, former Rossing Uranium miner and oesophageal cancer victim Peter Carlson who died in 1995. "ROSSING Uranium's parent company, Rio Tinto, is facing a new compensation claim related to alleged poor health and safety conditions at the mine. Anne Carlson, the widow of former Rossing worker Peter Carlson, is suing Rio Tinto in England seeking compensation for her late husband's suffering from cancer, her lawyers announced yesterday. Peter Carlson died of oesophageal cancer in January 1995. Mrs Carlson's lawyer, Richard Meeran, said the claim should not come as a surprise to the multinational mining company as they had been notified of the nature of Peter Carlson's illness in December 1994, shortly before he died. FORMER Rossing Uranium engineer and cancer victim, Edward Connelly, Thursday finally won his long legal battle to have the right to bring his compensation case in the British courts. BBC TV this week broadcast statements from four mineworkers who claim their ill-health resulted from poor working conditions at the Rossing Uranium mine. The BBC's main in-depth news programme, Newsnight, interviewed Edward Connelly, who Thursday won the right to bring his N$3 million compensation case in the UK, Petrus Hwaibe, Petrus Naibab, and featured an archive statement from the late Peter Carlson, who died from cancer in 1994.